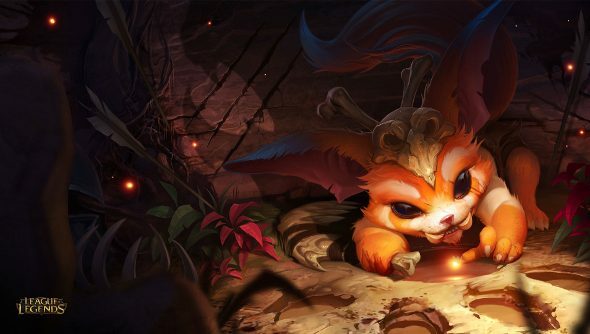 League of Legends’ Gnar revealed: What if The Hulk was a Gremlin? Jeremy was not far off when he compared League of Legends newest champion, Gnar, to a Gremlin earlier today. The wee beastie has been fully revealed by Riot, and yeah, he’s basically a Gremlin. Just bigger and meaner. Like a Gremlin warped by gamma radiation. And what a beast. The adorable little creature is a transform champion, with his Mini and Mega forms having different and distinct strengths and weaknesses. Mini Gnar is a bit frail, and to transform into his large, tanky Mega form takes time, as it requires his rage to build up. The wee fella can pester enemies from range, slowing and damaging them with his boomerang while maintaining a safe distance. But when he gets angry, well, you wouldn’t like him when he’s angry. Mega Gnar is a slow, powerful juggernaut with crowd control abilities and burst damage. He likes to be in the fray, but until Mini Gnar, doesn’t have a way to escape when things get too hot. An interesting quirk is the need to anticipate Gnar’s transformation. It can’t be controlled by the player, simply happening when his rage meter fills up.